‘Sweet Susita’ Monkeyflower is a natural selection of the native keystone plant, Red Monkeyflower (Mimulus aurantiacus puniceus). ‘Sweet Susita’ produces larger flowers than the common species, and blooms more over a longer period of time. 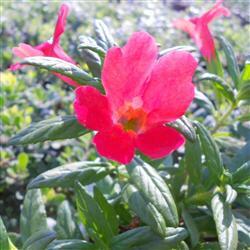 The abundant red flowers from Mimulus ‘Sweet Susita’ are a striking contrast to its lush, glossy green foliage. This monkeyflower makes a well behaved bush about 2 to 3 feet high and wide, and takes sun or light shade, preferring some light shade in the hottest inland communities. As with all monkeyflowers, consistent watering can hurt the plant; supplement its water for a month after planting time, then let it alone. A splash of water once or twice a month in the hottest parts of summer will allow monkeyflower to keep its leaves all year. Try planting ‘Sweet Susita’ Monkeyflower along a walkway, or layering it with taller natives behind— its cheery red flowers are unmistakable! About the name: we named this lovely monkeyflower “Sweet Susita” after a little girl in a rural Haitian village we met through a non-profit organization called Plant with Purpose. Every retail purchase of a 'Sweet Susita' generates a $0.50 donation to Plant with Purpose to help impoverished communities like Susita's.